As we outlined earlier, there are many political impediments to passage of a county-wide transit millage. Indeed, even the threat of a millage vote could move some townships to opt out of the new county authority once it is incorporated. (Recall that there is a 60-day window for units to opt out.) Thus, it is perhaps not too surprising that AATA leadership has begun to hint that a millage might not be necessary. The “funding source” is not identified, but since Michigan law prohibits almost all forms of taxation at the local level, again a millage was presumed to be the subject here. There is now apparently hope among some at AATA, especially Board Chair Jesse Bernstein, that this funding source might be a vehicle registration tax as proposed by Governor Snyder in his October 26 address on transportation and infrastructure. AATA interpretation of RTA plan. Click for larger image. Part of the Governor’s proposal would enable local transportation authorities to levy a vehicle registration fee of up to $40 per vehicle (NOT a tax, for constitutional reasons) upon approval of the voters in the locality. If this could be done in Washtenaw County, solely to support the TMP, it might be possible that it could replace a property tax. Bernstein has repeatedly held this out as a tempting possibility. It appears more and more likely that Bernstein and others are actually steering the process toward skipping a public vote on a countywide millage at this time and instead hoping that the vehicle registration fee replaces it. The millage vote appears to be politically unsound and likely to fail. This would put the TMP out of business. If there is a public vote on a vehicle registration fee, it would be a broader campaign than merely a transit issue. The Governor has proposed this as part of a general transportation initiative, mostly aimed at roads. It might have more popular support than a property tax aimed only at transit. The Michigan constitution allows up to 10 percent of highway user fees to go to transit. That is appropriate, because transit systems reduce highway congestion by offering alternative ways to travel, particularly for those who do not own or cannot drive a car. New regional transit investments supported by a regional motor vehicle registration fee will allow funding for long-awaited transit improvements that will help jumpstart Michigan’s urban areas and create jobs. The Governor also estimates that local fees will raise up to $300 million. It is not clear how that is calculated; presumably he is counting all the more heavily populated areas of the state. In any event, only 10% of that fee would be available for transit. But would even that amount appear? Rick Olson, a local state representative who was on a task force studying transportation issues, has weighed in (see article on AnnArbor.com). The report that he wrote has a number of interesting comments about Michigan tax law and the way a statewide referendum to change transportation funding would work. He makes it clear that the package of funding proposals is very complex, and has many controversial elements. He also (disturbingly) says that the package should be “revenue neutral”; like a good Republican, he is proposing no net increase in transportation funding. The local vehicle registration fee gets short shrift. It is clear that the Michigan legislature has a lot of ground to plow before the specific idea of a local fee for transit blooms. In fact, AATA itself, in the slide shown above, estimates a 3-year timeline. Don’t forget: as laid out by Olson, this would require a statewide referendum on a major change in tax structure in Michigan. Even if this idea progresses relatively smoothly through the Legislature and survives the statewide referendum, the local fee itself would depend on another public vote, namely in the four-county region designated for the Regional Transit Authority. As explained at the November meeting of the Financial Task Force, there would be a vote in the designated counties (Wayne, Oakland, Macomb, Washtenaw) and if a majority vote in the entire region is obtained, the RTA could impose the fee. (No opt-outs for individual counties, even if their own voters did not approve the tax.) 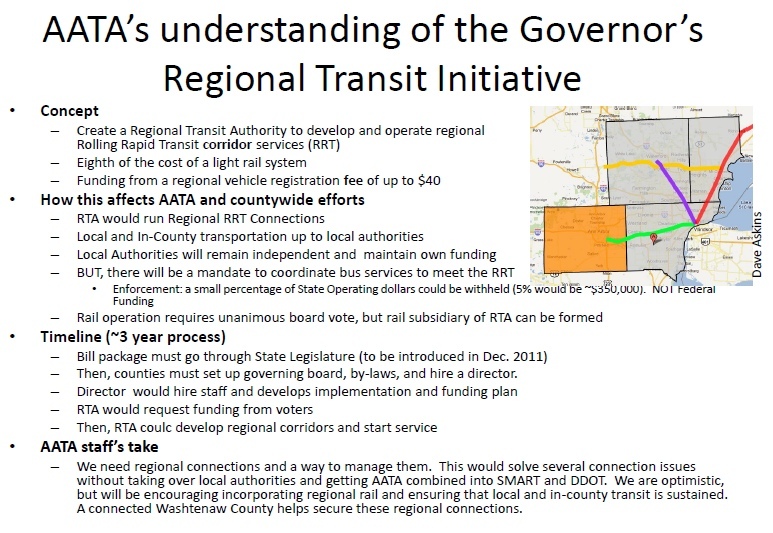 According to AATA’s interpretation, Washtenaw County would then receive the portion of the proceeds coming from this county, less 5% to the RTA for administration – but then only 10% of those proceeds would be designated for local transit operation (the remainder would be for roads and bridges). So it appears that some high-stakes poker is being played. Should AATA keep a safer, but perhaps losing, hand with cards that rely on a countywide millage vote? Or should they ask the dealer for those extra cards? If they do, they’ll be betting on just the right cards from the State Legislature – the statewide voters – and the voters in a four-county region. Quite a gamble. This entry was posted on January 2, 2012 at 3:17 pm and is filed under civic finance, politics, Transportation. You can subscribe via RSS 2.0 feed to this post's comments. You can comment below, or link to this permanent URL from your own site.